Late on Friday afternoon, Rep. Ed Markey (D-Mass.) 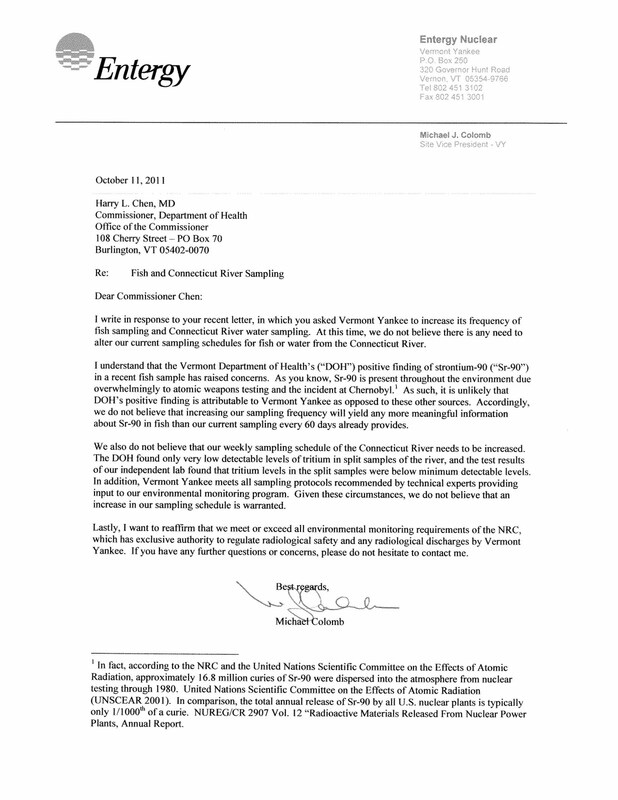 sent a letter to NRC Chairman Greg Jaczko accusing Entergy, the owner of the Vermont Yankee Nuclear Power Plant, of being less than truthful when it came to emissions of Strontium-90 (Sr-90) from the plant. 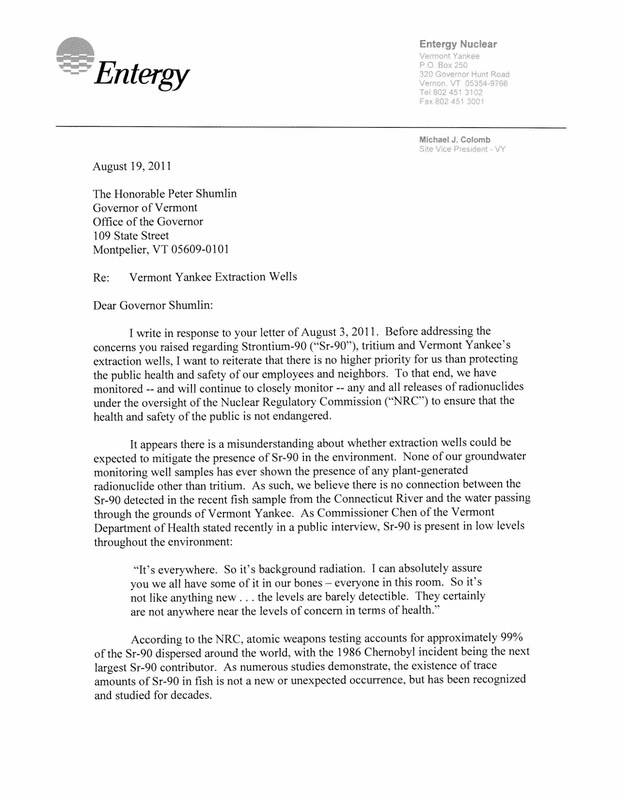 Markey’s letter came nearly three months after the incident in question. On Aug. 2, the Vermont Health Department announced that the radioactive isotope strontium-90 had been found in the flesh of small-mouth bass caught in the Connecticut River about 9 miles upstream from the reactor in Vernon. The plant is about three miles from the Massachusetts line; the river flows through Massachusetts and Connecticut before emptying into Long Island Sound. Markey took issue with a statement issued by Vermont Yankee spokesman Larry Smith saying that “There is absolutely no evidence to suggest that Vermont Yankee is the source for the strontium-90’’ in the fish. None of our groundwater monitoring samples has ever shown the presence of any plant-generated radionuclide other than tritium. As such, we believe there is no connection between the Sr-90 detected in the recent fish sample from the Connecticut River and the water passing through the grounds of Vermont Yankee. Vermont Yankee routinely monitors the environment for Sr-90. 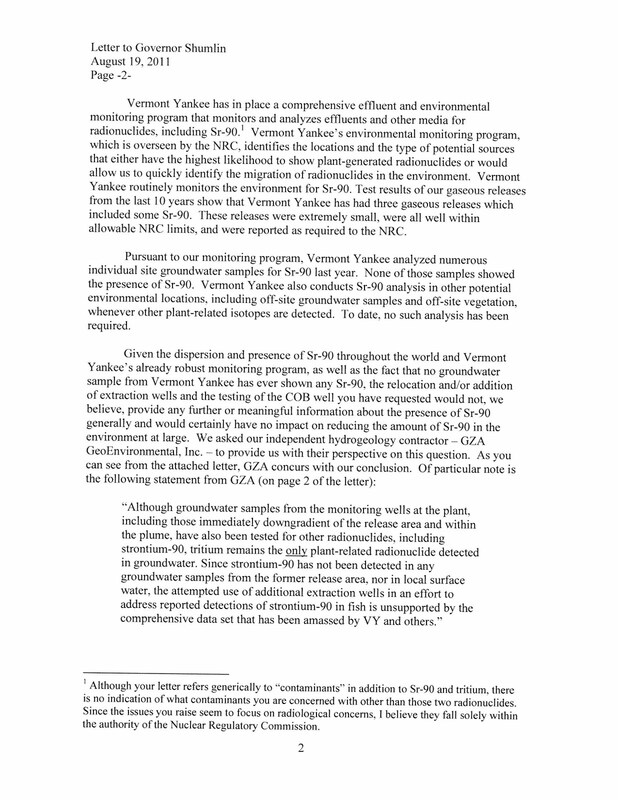 Test results of our gaseous releases from the last 10 years show that Vermont Yankee has had three gaseous releases which included some Sr-90. These releases were extremely small, were all well within allowable NRC limits, and were reported as required to the NRC. Colomb notes, however, that 99 percent of all Sr-90 found throughout the world comes from former atomic weapons testing programs, followed by a large dispersal after the 1986 Chernobyl accident. As numerous studies demonstrate, the existence of trace amounts of Sr-90 in fish is not a new or unexpected occurrence, but has been recognized and studied for decades. 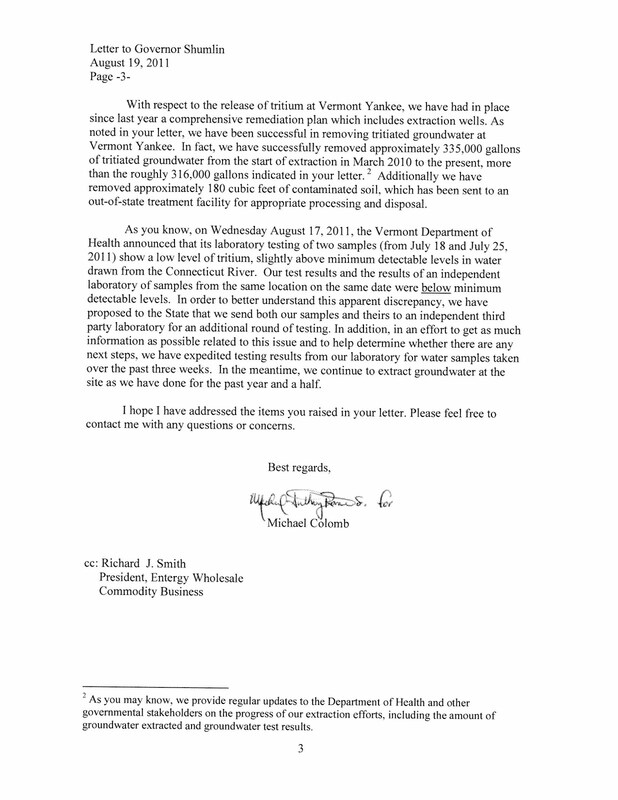 Just a few weeks ago, Colomb sent another letter to Vermont Department of Health Commissioner Harry Chen to follow-up on his request for the plant to increase fish sampling near the plant as a result of the incident. He reiterated that the Sr-90 found in the fish sample is unlikely to be attributed to Vermont Yankee as opposed to other sources. In fact, according to the NRC and the United Nations Scientific Committee on the Effects of Atomic Radiation, approximately 16.8 million curies of Sr-90 were dispersed into the atmosphere from nuclear testing through 1980. … In comparison, the total annual release of Sr-90 by all U.S. nuclear plants is typically only 1/1000th of a curie. I want to reaffirm that we meet or exceed all environmental monitoring requirements of the NRC, which has exclusive authority to regulate radiological safety and any radiological discharges by Vermont Yankee. The fact remains that Vermont Yankee has never had Sr-90 in any of its liquid releases and has not detected elevated levels of Sr-90 in any of its NRC-required environmental samples of ground water, fish, surface water, soil or vegetation around the Vermont Yankee site. Given these facts, Colomb reconfirmed in his letters that the presence of Sr-90 in the fish sample cannot be attributed to the plant. As far as we know, Chairman Jaczko has yet to respond to Rep. Markey's letter. When he does, we'll be sure to share it with you.